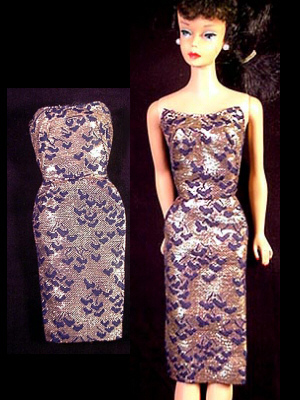 This is basically a remake in a different fabric of the strapless brocade dress from Golden Girl #911 (1959-1962), Evening Splendour #961 (1959-1964) and Golden Elegance #992 (1963) . It was only made for one year and is difficult to find. This is one of the most valuable (and therefore expensive) fashion pak items. The navy blue shoes are also difficult to find. It has a back zipper and is usually found in good condition, although the bust area can easily stretch and show wear.